In a bowl take all purpose flour (1 cup), baking powder (1sp), salt (1sp), red chilly powder (2 sp), pepper (1sp) and vinegar (1sp); to this add water (1/2 cup) and milk (1/2 cup). Stir constantly until all lumps dissolve and batter is smooth. 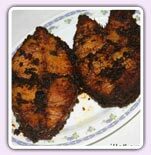 Heat oil (250 ml) in a pan; dip fish pieces in the batter and deep fry until golden brown. Sprinkle the coriander leaves, onion slices and lemon juice and serve.